Why can it be difficult to decide whether or not a person is an informal carer and does it matter? It is important to identify if someone is an informal carer or not; however this is a difficult decision to make as the change can have a huge impact on peoples lives. It can be a relief for some people to be recognised as it gives access to help and support they need. For others the stigma of being a carer can make them feel like less of a person, so because everyone is different it needs to be a decision that is right for the person involved. I care for my 5-year-old son Harry who has been diagnosed with a severe learning disability. He is a lovely little boy but most of the time very difficult to manage. It is very hard to take him out, as he has no sense of danger. ...read more. She is also able to give love, advice and support... [so] there is apparently a 'role reversal'. (Unit 1, P.21) The second complication is duration and frequency and applies to 'a person who both is the main carer and also spends 20 hours a week or more on caring'. 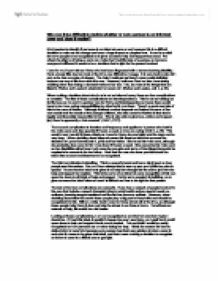 (Unit 1, p.19). This would mean I would fit these criteria as I care for Harry day and night and the days can be very long. 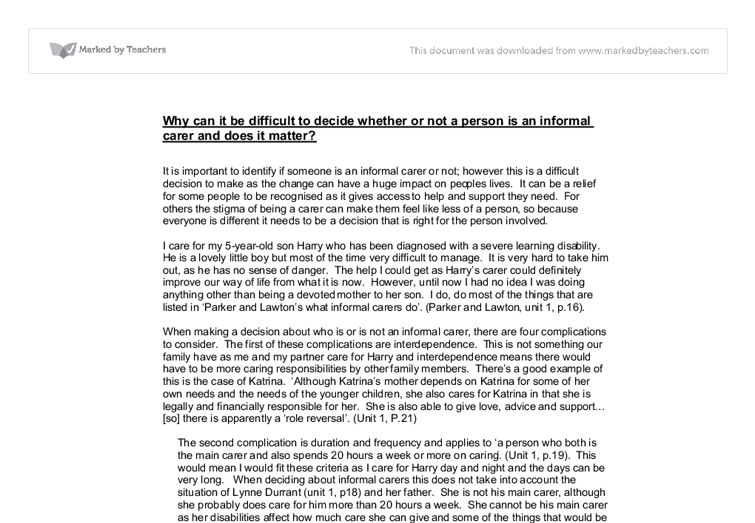 When deciding about informal carers this does not take into account the situation of Lynne Durrant (unit 1, p18) and her father. She is not his main carer, although she probably does care for him more than 20 hours a week. She cannot be his main carer as her disabilities affect how much care she can give and some of the things that would be required she cannot do for her father. ...read more. However, when deciding about informal carer's these people play a big part in Harry's life and should be recognised for this. Still on a daily basis I care for Harry almost all of the time, so although these people help Harry it does not help the stress in our lives at home. Yet without our network of help, life would be a lot harder. Looking at these complications, I am not recognised as an informal carer but maybe I should be. If I had this label, it wouldn't change the way I see Harry, or myself but it would open doors to help and support that is much needed. I do not think I would be easily recognised as I am just seen as a mother doing her duty. I think the reason it's hard to define informal carer's is because every person has their own opinion of what a carer is and what it means to be given this label, and that means making a decision to recognise an informal carer is a difficult one to get right. ...read more. * Use nonverbal communication such as pointing and touching * Offer assistance as needed * Don't talk about the person as if he or she wasn't there * Have patience, flexibility, and understanding Home Safety When caring for an individual with Alzheimer's disease at home, safety and accessibility are important concerns. Although in other situations where care can be reciprocated, such as looking after children, it could be difficult to identify if the person does require the level of care being given. Valerie did agree that she is able to cope at this present time with Barry`s needs but admits in her own words "I am not getting any younger". the ironing, they will make important decisions together and she will spend time alone in the house. She regularly got up out of bed, day or night, fell, and then needed assistance to resettle into bed. It is difficult to pick at what point the duration and frequency of the care qualified Margaret as an informal carer. Disabilities leave stains in people's lives. It is very stupid to think that communication and education are going to keep the problem going: by spreading the knowledge and the sexual education that is appropriate, Africans would know how to take care of themselves. It might take a long time, but it would surely work.